JACKSONVILLE, Fla. - Sept. 21, 2018 - PRLog -- North Florida Land Trust has acquired two conservation easements in Clay County marking the nonprofit organization's largest conservation easement acquisitions to date. 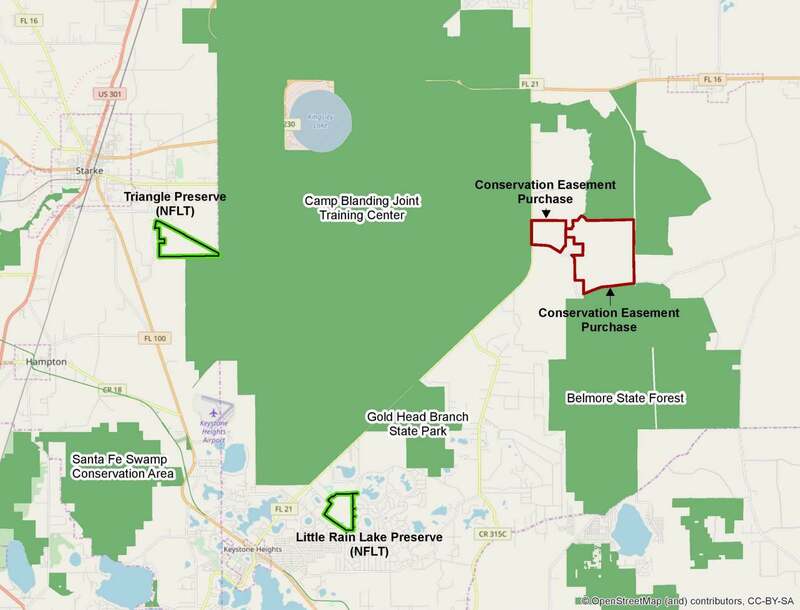 The two properties totaling approximately 2,551 acres will now be protected from high intensity development and will serve as a buffer for the Camp Blanding Joint Training Center. NFLT works closely with Camp Blanding to identify lands that are both prime for conservation and important to protect the military base from the threat of encroaching development. Funding for the purchases was provided by the Army Compatible Use Buffer (ACUB) program. "These conservation easement acquisitions mean we have been able to keep thousands of acres free from high intensity development in perpetuity," said Jim McCarthy, president of NFLT. "These are the largest conservation easement acquisitions North Florida Land Trust has been able to accomplish at one time in all of our 19-year history. This is about national security, economic development, community relations and conservation all working together for the greater good." "This is a great story of sustaining military mission capabilities through conservation and preservation partnerships, thereby sustaining Camp Blanding's mission readiness," said SJRWMD Governing Board member Gen. Douglas Burnett, former Florida National Guard adjutant general. "These acquisitions are important to the National Guard of Florida, which is recognized for its commitment to environmental protection." North Florida Land Trust is a nonprofit organization who serves as a champion of environmental protection primarily in Baker, Bradford, Clay, Duval, Flagler, Nassau, Putnam, St. Johns, Union and Volusia counties. NFLT was founded in 1999 and has protected thousands of acres of environmentally significant land including property at Big Talbot Island, the River Branch Preserve, Pumpkin Hill, Moccasin Slough, along the St. Mary's River and other valued natural areas predominantly in Northeast Florida. NFLT is funded largely by private and corporate contributions and works closely with private landowners and other public agencies at all levels of government, not-for-profit partners, and foundations. For more information, visit www.northfloridalandtrust.org.